I've been checking my tomato plants almost daily to see how they're progressing (lots of baby tomatoes!) 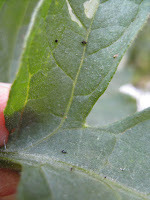 and also to check for signs of diseases and pests. This week I found my first tomato hornworm caterpiillar. Well, to be truthful, I found the frass first. Frass, you ask? Well, it's just a fancy word for caterpillar poop. It's usually easy to spot because it's dark and stands out strongly against the leaves, unlike the caterpillars themselves which tend to blend in. For a close-up of the frass, click here. I scoured the tomato bushes and found four young caterpillars and quickly introduced them to the bottom of my shoe. This is the first line of defense (pick and squash) if you're using integrated pest management. 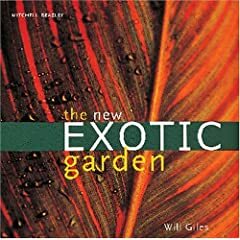 My next step was going to be treating the plants with Bacillus thuringiensis, a microbial insecticide, but I was unable to purchase it at my local big box store during last night's late shopping trip. Darn those big box stores. 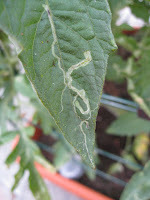 My tomatoes have shown other signs of pest damage, namely leaf miners, but I haven't treated them because leaf miners usually don't cause major problems. Tomato hornworms, on the other hand, have voracious appetities. No way I'm leaving those buggers on my prized tomatoes. Update 6/21/08: it looks like I misidentified this caterpillar. It's actually a tobacco hornworm (Manduca sexta) and not a tomato hornworm (Manduca quinquemaculata). 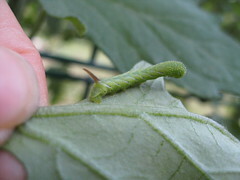 Tomato hornworms have eight white V-shaped markings on their side while tobacco hornworms have seven diagonal white lines. 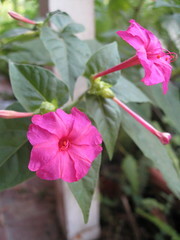 My four o'clocks started blooming this week! Apparently, they thrive on neglect. A co-worker gave them to me last year as volunteers he had pulled from his own yard and placed in pots with our native sandy soil. They are a classic passalong plant here in the South, in part because they self-seed so readily. I pretty much ignored them all year, except for stopping to inhale their intoxicating fragrance from time to time. Once our cold weather set in (yes, I know it's still mild by northern standards), the plants died back. I wondered how they'd fare since they're technically annuals, but was hoping they'd come back since I had heard that they create large, underground tubers. Sure enough! The foliage sprang up a month or so ago and now I'm graced with flowers. One of my other co-workers views four o'clocks as weeds. I disagree. I think they're wonderful. We're so lucky in the South to have such amazing weeds. 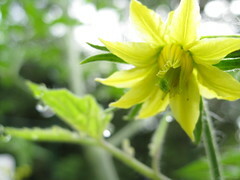 My tomato plants are flowering -- yay! I can hardly wait for them to produce fruit. I haven't seen any bees pollinating the flowers yet. My understanding is that tomato flowers are self-pollinating but require the vibration of bee wings in order for the pollen to shake free from the anthers and pollinate the stigma. Just in case any bees don't come along, I jiggled the flowers with my fingertip. We'll see if this is helpful or if I'm being an overprotective tomato parent. I want my tomatoes! Also, can you see the water droplets on the leaves in the background? Every morning when I come out to check on my tomato plants there are these beautiful water droplets along the edges of the leaves They're like little jewels the way they catch the morning light. I guess they're the result of the moisture the leaves have accumulated from a hard day of evapotranspiring. I imagine that the liquid makes its way to the leaf margins as the night progresses. Then once the sun rises each morning, the droplets are melted away by the sun's warmth, only to have the cycle begin again. Pretty amazing.